The Office of Economic and Workforce Development and the Office of Small Business recently launched the Small Business Acceleration Program, a first-of-its-kind pilot program that provides direct services to individuals seeking to open small restaurants and other brick and mortar food-based businesses in San Francisco and guides them through the current complex permitting process. Successful restaurants help to activate neighborhoods commercial corridors by reducing storefront vacancies, boosting foot traffic, adding to the variety of neighborhood-serving small businesses, creating good jobs for residents, and providing important spaces for neighbors to meet and socialize. 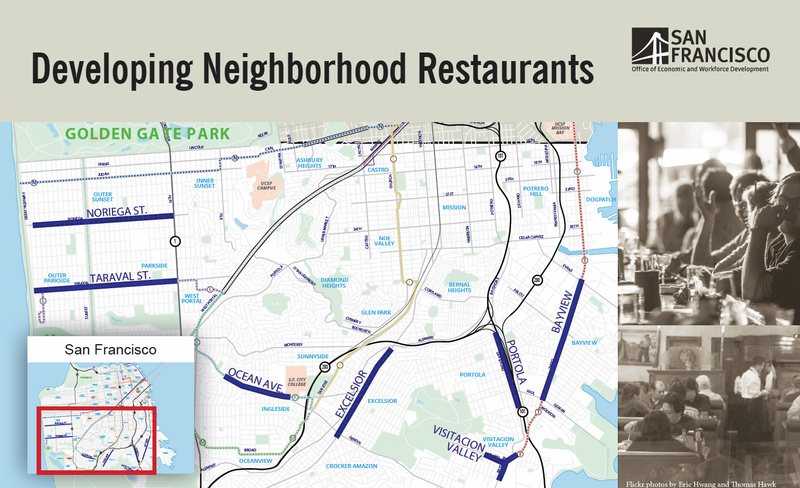 Despite San Francisco’s strong economy, it can be challenging for neighborhoods to support existing restaurants and attract new restaurants to vacant storefronts. One barrier to neighborhood restaurant success is the prohibitively high cost of a full liquor license that allows a restaurant to serve spirits in addition to beer and wine. These licenses are currently being sold for as much as $300,000 on the private market, and prices will likely continue to increase as the City keeps growing. These prices make full liquor licenses inaccessible for small business owners in the City’s outer neighborhoods, even though many of these commercial corridors would significantly benefit from successful restaurants. Today, Governor Jerry Brown signed into law SB 1285, a bill authored by Senator Mark Leno that will create a new type of affordable, non-transferable liquor license for existing and new restaurants in specific San Francisco neighborhoods. SB 1285 will increase the likelihood of success for existing neighborhood restaurants and create a tool to encourage entrepreneurs to launch new restaurants in currently vacant storefronts. For more information about SB 1285, please read this press release from the Office of Economic and Workforce Development, or download this fact sheet about the bill, which has also been embedded below. 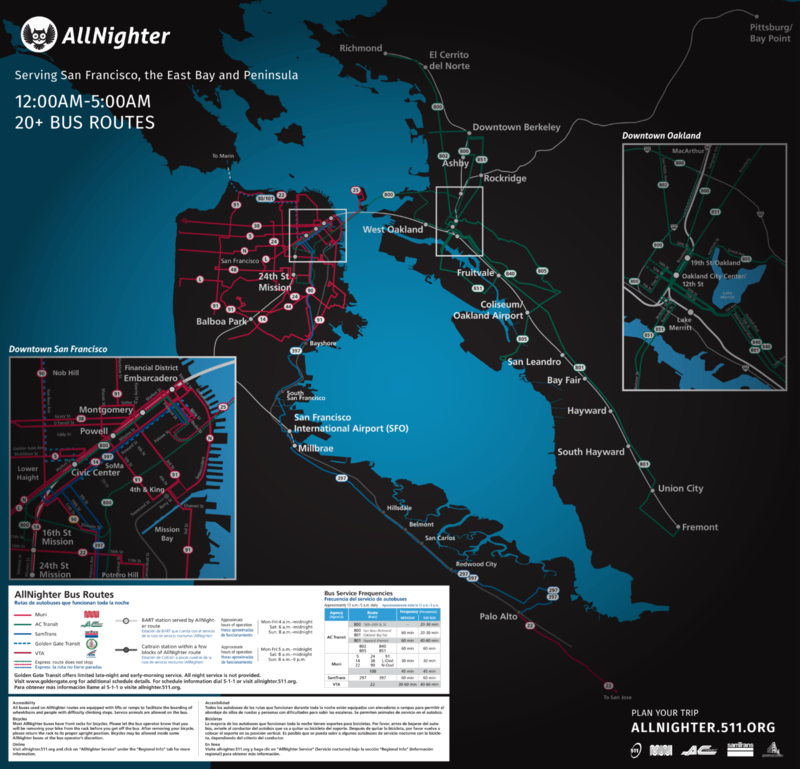 On Friday, August 5, 2016, the Office of Economic and Workforce Development and Supervisor Scott Wiener launched a new regional multilingual marketing outreach campaign for the AllNighter, the late-night and early-morning bus network that serves San Francisco, the East Bay, and Peninsula. The system, which is operated by the San Francisco Municipal Transportation Agency (SFMTA), AC Transit, SamTrans, and Golden Gate Transit, runs from midnight to 5AM and consists of over 20 bus routes, with stops at most BART and Caltrain stations. The newly redesigned map for the AllNighter system. Click here to download a PDF of the system map. 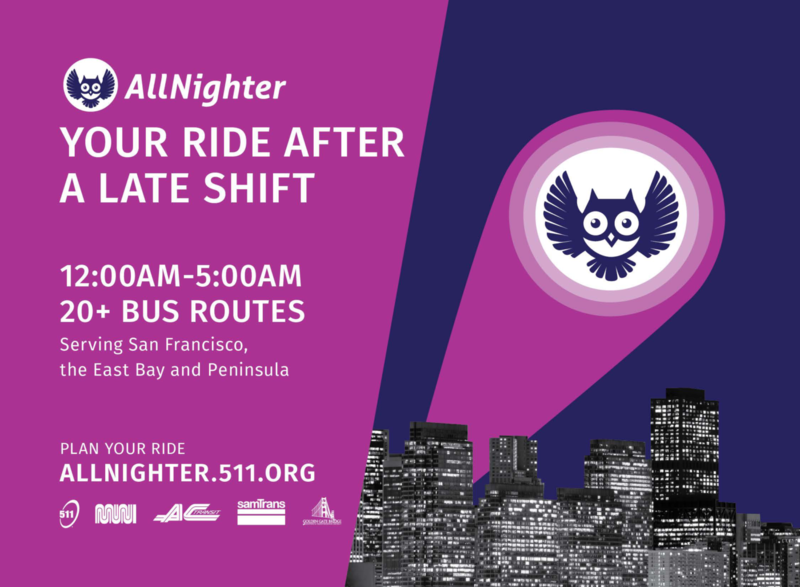 The AllNighter multilingual outreach campaign is one of the key initiatives recommended by the Late Night Transportation Working Group in its report The Other 9-to-5: Improving Late-Night and Early-Morning Transportation for San Francisco Workers, Residents, and Visitors. Over a period of nine months, the group examined the current state of nighttime transportation, surveyed workers, residents, and nightlife patrons, and came up with a set of recommendations. These major steps included, among other efforts, an information campaign that targets different segments of the late-night and early-morning rider and potential rider community. The report found that there was a lack of basic awareness and understanding of existing nighttime transit options. The first phase of the AllNighter outreach campaign features cable television, social media, bus, BART and Muni station advertisements. Partnerships with community organizations will be used to broaden the outreach effort. The project will run through the summer of 2017. The slideshow below includes a selection of images from the campaign. The Office of Economic and Workforce Development, which leads the implementation of the Working Group’s recommendations, worked closely with SF Municipal Transportation Agency (SFMTA), Bay Area Rapid Transit (BART), AC Transit, Samtrans, and Golden Gate Transit to develop the campaign, which received input from the San Francisco Entertainment Commission and the entire Late Night Transportation Working Group. The Metropolitan Transportation Commission (MTC) also supported the effort by granting $200,000, which will be used to sustain the campaign and measure its success. 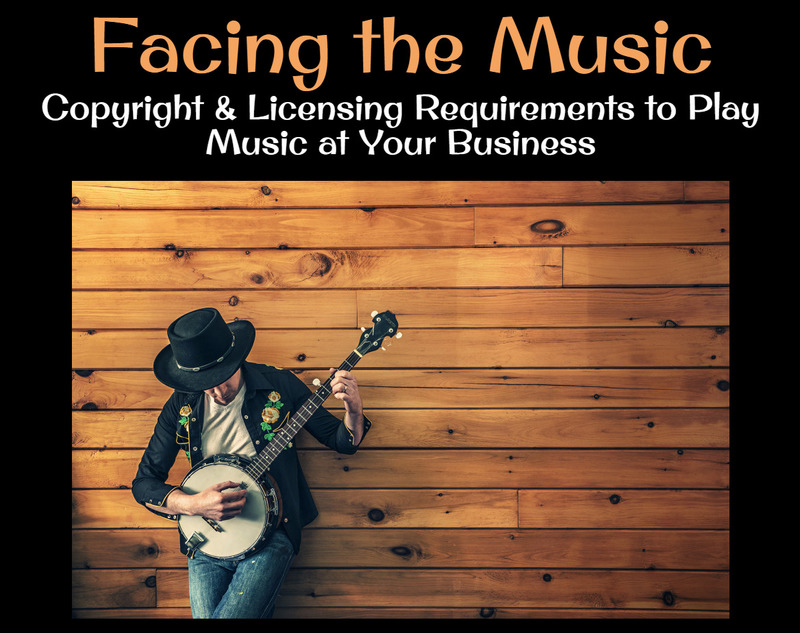 Is the music played in your business properly licensed, or are you at risk of a costly lawsuit? Many San Francisco restaurants, bars, retailers, and other businesses are unaware of the requirement to license the music that they play. Whether you’re using televisions, hosting live entertainment, or simply plugging in an iPod, you likely need a license to protect yourself from a lawsuit. Please join the Office of Economic and Workforce Development, Michelman & Robinson attorney Ilse Scott, the San Francisco Entertainment Commission, and the Golden Gate Restaurant Association, for a free seminar covering music licensing requirements and the options you have! Please email Samantha Higgins at Samantha[at]ggra.org with any questions. NightlifeSF is a project of the San Francisco Office of Economic and Workforce Development. See more information about this site, learn more about our work to support the nightlife and entertainment industry, and read this disclaimer.